In that quiet time of the year between developer conferences and the back-to-school sales, product announcements are scarce — but the hazy, lazy days of summer are no vacation for the legal world! As El Kaiser and J.D. discover on this week’s episode, court rulings and decisions by lawmakers dominated the news this week, with a few bug revivals thrown in for good measure. J.D. also explores the new Windows 10 Timeline feature in Microsoft’s latest operating-system update, so beat the heat and find a cool place to settle in with Episode 279! Roving correspondent Jocelyn Gonzales is back with a report on do-it-yourself iPad magazines and the online service that helps put them together while Pedro barely keeps his inner-Miley at bay as J.D. 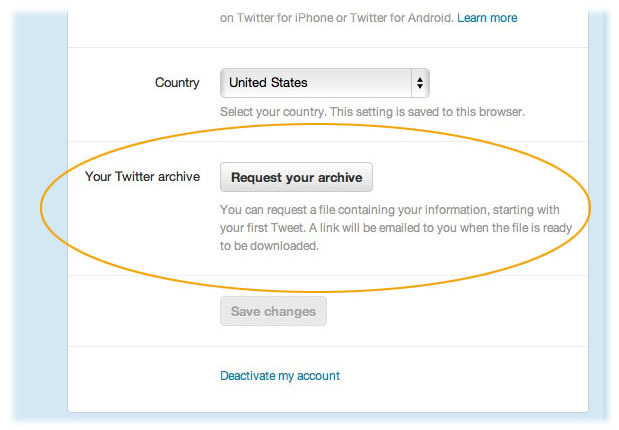 explains how a user can get a complete archive of their Twitter posts. In the news, Microsoft CEO Steve Ballmer announces his retirement; Nokia gets set to launch a Lumia tablet; Samsung and Apple plan big September announcements; Apple TV gets more channels; and Kevin Spacey lays the truth down on the television industry. As mentioned on a previous episode, you can download a copy of everything you’ve posted on Facebook and Google+ for archival reasons, because you’re-mad-and-you’re-leaving or just to see how you’ve matured online over the years. You can do the same thing with Twitter. Be warned, though — some of those early tweets may be a little cringeworthy if you were still getting used to the 140-character limit or hadn’t quite found your online voice. Log into your Twitter account on the Web and click on the gear-shaped settings icon in the top right corner of the screen. 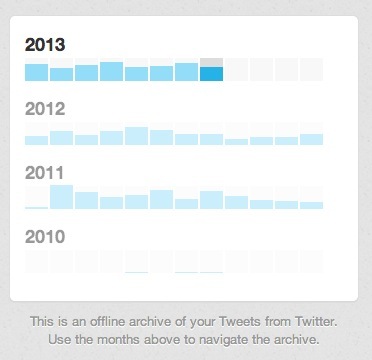 On the Account settings page, scroll down to the line that says Your Twitter Archive. Click the Request Your Archive button. When your archive is rounded up and ready, Twitter sends an e-mail message to the address associated with your account. Click the link included int he message to download the tweets.zip archive file. When you unzip the tweets file, click on the index.html file inside the folder. Your Web browser opens up the page locally and displays a long list of your past tweets, along with a clickable graphic you can use to pinpoint tweets from a certain year and month. This can be handy, say, if you wanted to reread your thoughts during a Presidential debate or when you were waiting in line for that midnight screening of The Dark Knight Rises. The graphic also shows in bar-chart form (below), how many tweets you posted a month and you can quickly see if you’re a binge tweeter or more of a random poster. You can also use keywords to search through your tweets from the page. So that’s how you can relieve you’re Twitter history — all without having to scroll backwards in time. The official Twitter blog has more information here.